The Komodo dragon is a large species of lizard found in the Indonesian islands of Komodo, Flores, Rinca, and Gili Motang. A member of the monitor lizard family (Varanidae), it is the largest living species of lizard, growing to an average length of 6.5 to 9.8 feet and weighing up to 150 pounds. As a result of their size, these lizards dominate the ecosystems in which they live. Although Komodo dragons eat mostly carrion, they will also hunt and ambush prey including invertebrates, birds, and mammals even up to deer size. The Komodo dragon has a tail as long as its body, as well as about 60 serrated teeth that can measure up to an inch in length. Its saliva is frequently blood-tinged, because its teeth are almost completely covered by gingival tissue that is naturally lacerated during feeding. This creates an ideal culture for the virulent bacteria that live in its mouth (which they are famous for). Conservation Status: Although Komodo dragons have thrived in the harsh climate of Indonesia’s Lesser Sunda Islands for millions of years, their existence was unknown to humans until about 100 years ago. Unfortunately, these dragons are now endangered due to poaching, human encroachment, natural disasters, and a decline in egg-laying females. 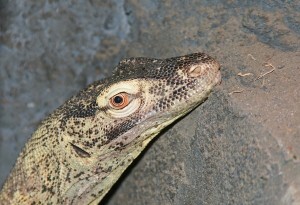 Komodo dragons have a keen sense of smell, and they have been known to hunt in packs to bring down prey. Larger dragons eat first, while smaller dragons get what’s left over. To avoid becoming their cannibalistic elders’ dinner, hatchlings immediately take to the trees. A Komodo dragon can eat up to 80% of its body weight in one meal.